We are a family run business. Two generations are still involved in the day to day running of the company. BST Scaffolding is a highly reliable scaffolding company based in Bromley, Kent. BST operates from its base in Bromley, reaching out to construction and repair projects in nearby London, Kent & Surrey towns and villages. The majority of BST Scaffolding work is carried out in South East London, Kent & Surrey. Specifically, you may have seen our scaffolds in areas like Croydon, Bromley, Dulwich, Redhill, Kenley, Penge, Sevenoaks, Lewisham Westerham and all areas in between. We have built up a strong reputation amongst homeowners, local authorities & developers alike. We are the name to trust when it comes to erecting and removing scaffolding structures with the least fuss and in line with all health & safety regulations. WITH ONE QUICK PHONE-CALL TO OUR OFFICE, YOU CAN FIND OUT MORE ABOUT OUR SMOOTH DOMESTIC AND COMMERCIAL SCAFFOLDING SERVICES. REQUEST A FREE QUOTATION OR FURTHER INFORMATION ABOUT OUR RANGE OF SERVICES. WE LOOK FORWARD TO HEARING FROM YOU. Without scaffolds and truly competent scaffolders, many building & roofing projects and repairs would be held-up or just not possible. Having a reliable scaffolding company on-hand is key to the success of any developer. Scaffolding towers and platforms provided by BST Scaffolding allows safe access to all above ground working areas. Although our teams cover a large area, we are still a family run business and we are not too large to care. You will typically speak to one account manager during your dealings with BST. Why not give our friendly office staff a call today. 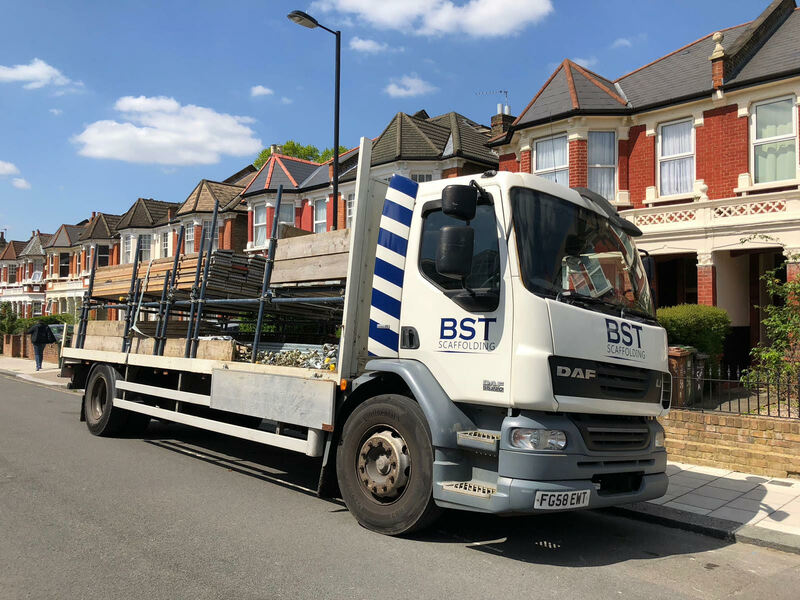 BST will give any advice and an estimate where possible or arrange for a site survey from one of our experienced site managers.Here at BST we also arrange pavement licences with the local authorities and TFL with no admin cost.